Our new Soundpack adds to the growing selection of Zombie-themed effects we’ve created for your modern horror campaigns. The dead are returning to life and attacking the living. The government has responded to this world crisis. How will they keep the public informed? What about the media? Transmissions from the Zombie Apocalypse gives you audio clips to use during your zombie campaigns. Now your players can hear what’s going on in other parts of the world as the crisis unfolds. Perfect for modern zombie survival games. • Police Radio Call: A patrol car responds to a disturbance in a hotel parking lot. • Domestic News Broadcast: WTBI radio provides a chilling look at what’s happening in the U.S. after the first few weeks of the zombie uprising. • World News Broadcast: Radio London reports how other parts of the globe are dealing with the zombie outbreak. • Emergency Action Message – National: The National EAM system has been activated due to a biological threat. • Emergency Action Messages – Local (4 Messages) The local EAM system has been activated due to a violent incident. • Traffic Report: WTBI’s own “Eye in the Sky” Stevie Andrews reports on a crashed bus on the highway. But why are some of the accident victims attacking paramedics? 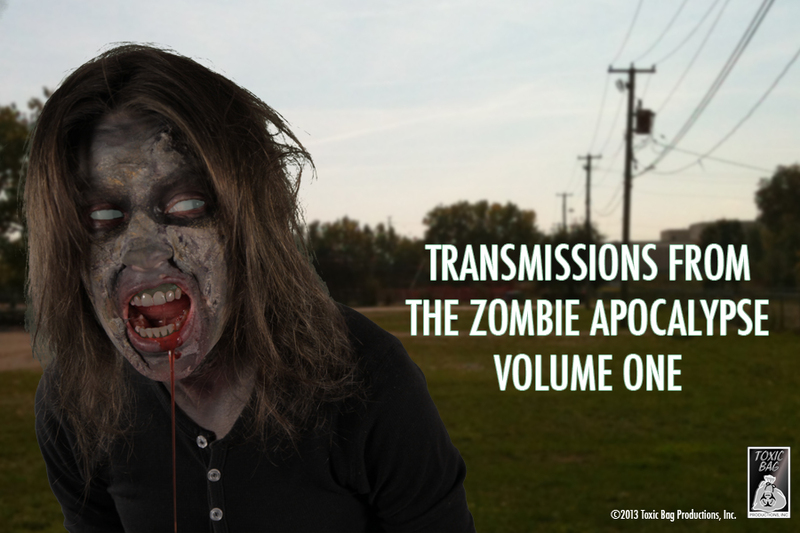 Transmissions From The Zombie Apocalypse Volume One is available from Toxicbag.com or DrivethruRPG.com. And don’t forget our Free Sound tie-in: the Zombie Apocalypse 911 call! Toxic Bag Productions, Inc. provides sound effects and music for independent films, animated shorts, theatrical productions, dance performances, podcasts and video games. They work out of their studio on the north side of Chicago. Posted on October 30, 2013, in RPG Sound, Sound Effects for RPGs and tagged gaming, horror, Role Playing Game, RPGs, sound effects, terror, walking dead, zombie. Bookmark the permalink. Leave a comment. Toxic Bag Productions, Inc. is Steve "Blood" Baldwin and Joe Griffin. We make sound effects for role-playing games; we make board games; we make sound design for theatre and film; and from time to time we just make noise. Unless we tell you otherwise, Joe (sound designer/scalawag) is the one doing the blogging.